Situated in Pham Ngu Lao Street, a quiet cozy street during the day and a popular dining and recreational destination come nightfall. Vietnam Backpacker Hostels - Hue is perfectly located, right in the middle of the Imperial City, to explore the many sights that Hue has to offer. 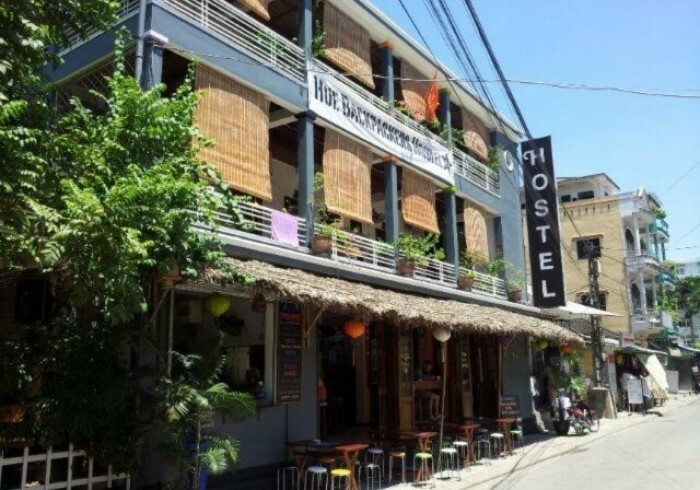 Vietnam Backpackers Hostels - Hue is housed in a beautiful, colonial building. The wide verandas on the 2nd and 3rd levels are the first things you notice about the building that were originally built in the 1930’s. They are perfect for kicking back & reading a book, sipping on an ice cold Vietnamese coffee or an even colder “Huda Beer” as you settle in to the relaxed pace of Hue. Located on the ground floor is the Restaurant and Bar where you can get big, tasty meals at Backpacker friendly prices, icy cold beers and soft-drinks while chilling out listening to some tunes or catching up with your traveling buddies. There are different events on everyday as well as DAILY happy hours and food and drink deals. We also offer: -	FREE WIFI -	FREE computers for guest use -	Motorbike tours to an abandoned water park -	Cooking classes -	24 Hour Reception & security -	Airport Pick Ups -	Visa Invitation Letters We have an awesome travel crew who are ready to help with all your travel needs in and around Hue as well as the rest of the Vietnam. And of course we can’t forget to mention that we are the home of the original Castaways Island trip in Ha Long Bay! Look out for our Red Buffalo and find our other hostel sites in Hanoi and Hoi An; an escape to paradise at our backpacker resort, Ninhvana; a stay in our NEWEST urban hostel in Sai Gon; a rural countryside adventure in the North AND of course, we can’t forget to mention that we are the home of the original Castaways Island trip in Ha Long Bay!